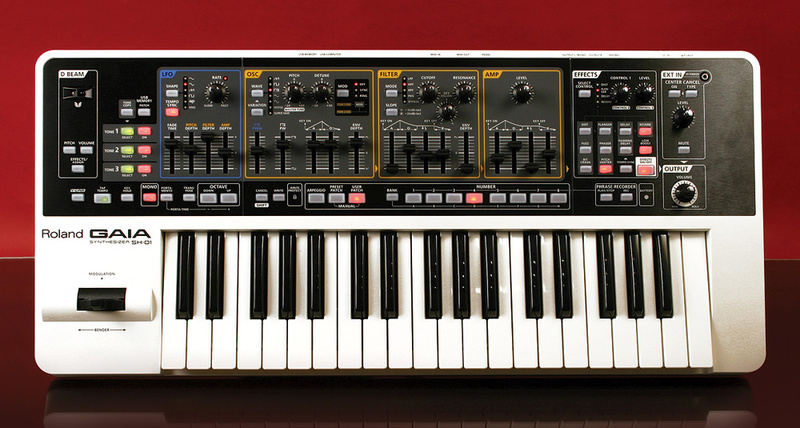 Roland haven't exactly flooded the market with analogue modelling synthesizers since the JP8000 in 1997. It took another 10 years before the SH201 appeared, considerably cheaper, yet unlikely to ever generate the same interest. Next up is the brand new Gaia SH01, which is potentially more memorable, thanks to its impressive polyphony, convenient size and a back‑to‑basics layout. Throw in the ability to act as your computer's audio interface, pitch the price just right, and this curvy white and black synth could tempt beginners, experienced campaigners and live performers alike. Maybe the name has worked its spell on me (I can't stop dreaming of dolphins and incense) but I find the Gaia SH01 to be Roland's most touchy‑feely synth in years. Back-lit buttons in several colours contribute to a look that falls somewhere between elegant and kitsch, with a dash of boutique hi‑fi. The blend of knobs, sliders and buttons is perfectly judged; sliders where speed is required, knobs for precision. For each modulation depth, a gentle detent in the middle of the control marks the zero point because, happily, all modulation is bi‑polar. Brimming with confidence, this synthesizer banishes the usual screen and menu systems. Admittedly, this leads to an arcane subset of normal operations centred on the Shift key, but there's still a healthy whiff of old-school values — in keeping with the 'SH' prefix. On the flip side, you'll see there's a battery compartment, although if (like me) you don't have the eight AA batteries required, the more usual external power arrangement applies. Battery life is quoted at five hours. In a niche at the rear are two USB sockets: one is your means of doubling the onboard patch memory, the other provides direct connection to a PC or Mac. Two MIDI ports are present (no prizes for guessing the one that isn't), and audio is delivered via the familiar stereo pair of quarter‑inch jack sockets. A headphone output and pedal input complete the rear connections, although there is one further input, a stereo mini‑jack on the front panel. The SH01's front panel. As you can see, everything is controlled via knobs, buttons or sliders, without even an LED display to be seen. The architecture Roland have chosen is both classic and easy to grasp: oscillator, filter, amplifier (each with an envelope), plus an LFO to move things around. Depth and complexity are achieved by simply tripling this structure. The three tones are layered across the keyboard without the option of splits or zones — either for simplicity's sake or because the keyboard, at three octaves, isn't long enough to justify it. If you imagine that everything is going to take three times as long to program, you needn't worry. You can freely select one, two or all three tones to tweak at once, and there's also a helpful tone 'copy and paste' button. Programming is, therefore, refreshingly fast, direct and inviting — exactly as it should be. Up to 64 notes of polyphony is quoted, which is a surprising amount for a modelling synth of this type. Remember, Roland's JP8000 could summon only eight notes, the SH201 a couple more. Like me, you might be wondering how this is achieved and how it can be exploited — but all I could discover was that it involves a new-generation chip with greater processing power. The picture becomes cloudier when you realise that the SH01 contains a complete General MIDI 2 engine only accessible via MIDI. This inclusion seems quaint, especially since neither the GM logo nor any listing of the GM2 patches appear in the manual. Delving further, I figured the logo failed to earn its place because only 15 MIDI channels are available for GM playback (one is reserved for the SH01 itself). Without resorting to external rechannelisation, you can't play the GM patches from the SH01's own keyboard, nor is there any clear indication of how resources are shared between the GM and the SH01 synths. All I can tell you is that I never ran out of notes, and never felt close to doing so. Ultimately, despite the slightly weird implementation, the GM voices could prove handy if you're gigging with just an SH01 and a sequencer. Alternatively, they could be a hindrance if you need the SH01 to share a MIDI port with another synth (because there's no obvious way to turn off GM channels that are not needed). There's a further twist, in the form of a single bank of sample‑based presets. There are just eight of these, consisting of a church organ, some strings, brass and saxophone, plus some 'do do dah'‑type voice samples and an ethereal choir. When selecting a patch from this eclectic collection, the analogue modelling synth is temporarily locked out. It may be that these are someone's idea of the peachiest sampled sounds ever. Your mileage may vary. At the back of the SH01 are a power button and port for the external PSU, headphone and stereo outputs on quarter‑inch jack sockets, connections for an optional pedal and MIDI I/O, and two USB ports. The PCM diversions aside, all the usual analogue waveforms (and noise) are offered, plus Roland's much praised Supersaw. This simulation of seven stacked and slightly detuned sawtooth waves invokes a lush ensemble even with just one tone active. Engage more and the SH01 rapidly fills out into morbid obesity. Each oscillator waveform possesses three tonal variations; these, although sometimes subtle in isolation, help achieve a more natural blend when stacking tones. There is a limited amount of interaction between tones 1 and 2 — essentially ring modulation and oscillator sync. When you switch into either of these modes, the tone buttons turn orange as a reminder. Ring modulation is great for clangy, metallic textures, but oscillator sync, although rough, brash and cutting, has the unfortunate side effect of forcing the synth into mono operation. It is in mono mode that the SH01 reveals its digital origins most clearly, specifically in the envelope department. To illustrate what I mean, here's a simple test. In mono mode, set the amplifier envelope's attack and release to maximum then hold down a note so that the level gradually increases. Release the note and quickly play a second one. In an analogue SH synth, the second note smoothly starts its ascent from the current release level. However, the SH01 does what many other digital synths do, which is to assume that every note lives in isolation. New notes start their journey from silence, and therefore the SH01's mono patches sound most realistically analogue with short attacks. Long ones invariably deliver deviant accordions. It's only fair to point out that Roland aren't alone in this 'mono sin'. The same behaviour is seen in many software synths, suggesting that the major push has been to mimic analogue oscillators and filters, leaving envelopes, well, 'unlicked' is the word that comes to mind. I can't really consider this behaviour a 'con' (it may be that the goal was not to simulate analogue envelopes anyway) — but here's a plea to developers everywhere: remember the humble capacitor! Moving swiftly on, the filter sports four modes: low‑pass, band‑pass, high‑pass and peaking, with each switchable between 12 and 24 dB. I thought the low‑pass response a little odd at first; it becomes surprisingly restrained (or maybe compressed) as resonance increases. This isn't to say that it lacks squelch — it doesn't. And with familiarity I came to appreciate it as one of Roland's better digital filters, in terms of not actually lobotomising anyone at high resonance. The SH01 grows in stature as you spend more time exploring it. It willingly supplies the full spectrum of analogue noises, from warm, fuzzy strings and blippy arpeggios to fat, blubbery basses and loads of solid, contemporary sounds. It's refreshing to encounter a modern instrument designed to be programmed, rather than merely permitting it. As there's no 'take‑up' mode for the controls, you may experience audible leaps when you select a patch and get stuck into making adjustments. Happily, for the dedicated tweaker, there's a leap‑free manual mode that sets all parameter values to their current live positions. Having quickly established itself as versatile, I was surprised to discover the SH01's patches totalled just 64 preset and 64 user. With a spare USB memory stick slotted in, you gain space for an extra 64 original patches plus eight more phrases. Since patches are known only by their bank and number anyway, it could be that this is as many as anyone is expected to remember. While USB memory is a helpful add‑on, it's the second USB slot that hijacked my interest. Connected to a PC or Mac, the SH01 not only gains direct MIDI communication but also becomes an audio interface, complete with input via the Audio In socket. The supplied disc contains PC drivers, and I'm pleased to report that they slipped in without even the hint of a glitch. Mac users have to visit Roland's web site to gather theirs, but after that it's plain sailing too. As a would‑be laptop companion, the SH01's credentials therefore include controller keyboard, sound generator and audio interface abilities. I found audio quality well up to scratch when playing back songs from Ableton Live on a Windows XP PC and, later, on a Mac running OS X. 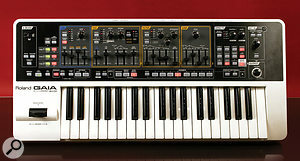 There is one slight down side for computer interaction, though, and it relates to Roland's eternal struggle with the concept of MIDI continuous controllers. I really hoped to use all those lovely knobs and sliders to control my soft synths. Initially, all looked good; I turned a few knobs and MIDI CCs spilled forth. It was only when I began assigning parameters to some objects in Logic that I realised the envelope sliders weren't playing ball — they weren't sending any data. A browse of the manual revealed an extra edit mode that forces these sliders to generate System Exclusive data — but I could find no way to address the CC oversight. Let's hope this can be remedied in an OS revision not too far in the future. Further widening its repertoire, the SH01's analogue input takes an incoming stereo source and mixes it with the regular post‑effects output. There's a dedicated level knob and a mute button, plus three 'cancel' algorithms that can be invoked to eliminate various signal bands from the centre of the mix. Typically, the cancel feature is intended to remove vocals, kicks/basses or just about anything placed centrally. The effects implementation sits neatly in the Goldilocks Zone: it's just right. Select the effect you want to tweak and two knobs serve up the most important parameters, with the Shift key adding two more. Logically, when you activate an effect, it is also instantly selected for knobby adjustment. The four simultaneous effects are: modulation (or pitch shift), distortion, delay and reverb, plus there's a low‑boost that can be switched in whenever extra oomph is needed. Of the three distortion algorithms, my personal favourite was 'Bit Crash', its range encompassing the charms of ancient low‑resolution samplers and extending almost into vocal filter territory. The flanger and phaser are both spacily on the money and the only blatant omission was a traditional Roland chorus. Fortunately, I found the pitch‑shifter able to simulate a reasonable detuned chorus, which was possibly a better bet than its rather gritty pitch‑shifting. Delay comes in two varieties and reverb has three types, which means that all the basics are covered with a minimum of fuss. The keyboard's velocity response is initially turned off, but if that's a retro step too far, it's soon remedied. You can then begin applying dynamics to the filter or amplitude. Although the keyboard doesn't have aftertouch, other expressive avenues on the map are a programmable pedal input, Roland's combined bender and modulation lever, and a D‑Beam motion controller. Setting up the modulation lever's actions requires one of those Shift-key operations. In the shifted state, the tone's regular LFO is shunted aside in favour of an otherwise hidden 'lever LFO'. Given that the tone LFO already brings modulation to your fingertips with three very accessible sliders, you might not even care about this second LFO. Me, I reckon the more the merrier. Both LFOs have identical waveform and clock sync options, although only the tone LFO has an auto fade‑in function. Compact without being cramped or compromised, the SH01 is all about direct, uncomplicated synthesis anyone can understand. By layering tones and making individual adjustments to each, you'll find that patches of considerable subtlety or monstrous mushiness are yours to command. Perhaps not the most authentically analogue‑sounding virtual analogue, its bright, modern sheen and distinctive filters identify a synth that is classy in its own right. Its polyphony eclipses all synths in its market area — and then some! Take into account the effects, the external input and the audio/MIDI interfacing and it's clear that the SH01 punches above its weight. Yes, it would have been nice to have better access to the GM2 sounds (if only because they're there), and it would have been nicer still if all the sliders transmitted MIDI continuous controllers. However, at the price, my niggles (and my personal envelope crusade) hardly make a dent in the SH01's highly recommended status. For more realistic analogue tonality, plus an array of impressively modelled filters, the Akai Miniak and Alesis Micron are both cheaper than the SH01. However, they are restricted to eight-note polyphony, have a labyrinthine menu‑based programming system rather than knobs, and don't speak USB. Korg's Microkorg XL is another possible contender, being easier to edit than the Akai/Alesis, and it has a great vocoder. The Microkorg brings USB MIDI and free editing software to the table, although it lacks the SH01's USB audio functionality. If you can adapt to its diddy keys, it might be worth a look. The final alternative is Waldorf's Blofeld keyboard which, because of its screen, is reasonably accessible, and it features Waldorf's own particular brand of sound and synthesis. However, like the rest, it can't match the SH01 for simplicity of approach or polyphony. The arpeggiator is packed with 64 different patterns that start with the expected up, down, alternate, and so on, and end amongst a host of exotic rhythmic alternatives. Engage the Hold button, so that the arpeggio runs freely, and you're able to devote all your attention to experimenting with the controls. When you finally drag yourself away from the arpeggiator, there's a second slice of auto‑performance bliss to enjoy, in the form of the Phrase Recorder. This real‑time recorder of keyboard performance and controller tweaks has been around for a while, in various incarnations. Recordings can be from one to eight measures long and are potentially even more showy than the arpeggiator — so it's a shame there's only room for eight phrases in total. If you select a new phrase while one is playing, it takes over seamlessly after the last measure completes. Recording of knob twiddles with no associated keyboard action produces looping tonal changes you can apply freely to any performance. And if you prefer to record something precise and 'sequence-y, switch on the arpeggiator and capture its output as a phrase. Neat. A quick word about how the SH01 handles tempo: there's a tap tempo button ideal for manually sync'ing to other players. Tempo is stored in each patch, along with any arpeggio pattern used, plus the usual tempo‑aware parameters (ie. LFO clock divisions and delay times). Alternatively, you can sync to incoming clock, from the MIDI input or from MIDI over USB. Three-tone structure is simple, yet powerful. The usual for a budget synth — no aftertouch, external power supply. Despite all that polyphony, only multitimbral via a General MIDI synth. 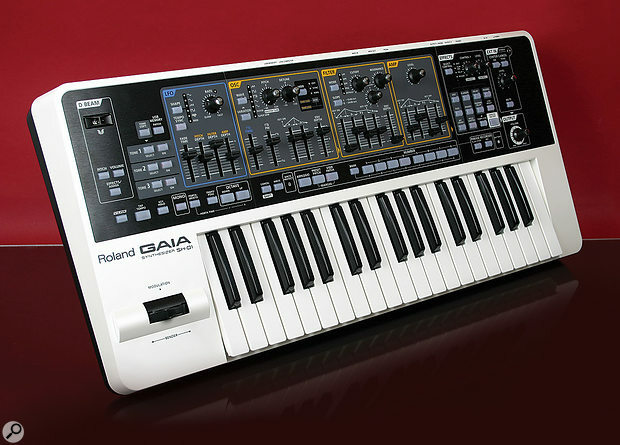 The Gaia SH01 is Roland's best‑sounding 'digital analogue' since the JP8000. It should appeal to anyone who wants to program their own sounds but has neither the time nor the patience for menus and unnecessary complication. Roland US +1 323 890 3700.